People born specifically on the 22nd of April are assumed to be bright, charming and well grounded but not as sociable or agreeable as other bulls. The astrological planet that rules over this particular day is Uranus gifting you with heaps of originality and a slight eccentricity. If you have this birthday your industrious, determined and focused temperament remains calm and composed in the majority of situations. This can make you appear rather cool emotionally. You are usually sensible and practical with a strong appreciation of nature, art and music and like to collect and preserve things. You have a dreamy side but generally have your feet firmly on the ground and need to see, hear, smell, taste or feel something to believe it. Individuals with an April the twenty second birthday are caring, faithful mates who do not make promises lightly and stick to them. You do not often cope well with changes and you are not so great at compromising either. Career choices to a person born on the twenty second of April are ordinarily based on purposefulness and satisfaction ahead of pay. You need to feel that the work you do has a worthwhile objective and you are valued. With your numerous talents you have the potential to go far in life but sometimes choose to ignore opportunities. You are not too concerned with owning the latest material possessions and take care with responsible spending. Your ability to effectively handle finances and save sensibly sees you rarely experiencing problems in this area. You are also destined to be fortunate financially. For a Taurus, the person born on the twenty second day of April is typically tenderhearted despite their aloof cover. You generally have lots of friends and are not particularly keen on personal relationship commitment unless your inner voice says you have met your true soul mate. When you do commit it will be due to your desire for a settled home life and an intense sexual and emotional connection with someone special. Generous and patient you are eager to satisfy your partner's passions as well as your own. You are likely to be much more demonstrative in private than you are in public and frequently display a stubborn resistance to unexpected changed circumstances. Nevertheless in a long term loving partnership you are extremely devoted to your other half and prone to be overly possessive in an attempt to express your devotion. 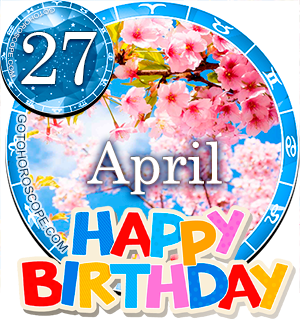 The usual mostly problem free health experienced by those born on April 22nd is not just put down to luck. Your probable good intentions regarding nutrition and fitness are the best way to approach and manage healthiness and help you stay healthy. You do not tend to take up unhealthy habits but you do have a proneness to overeat occasionally. People born on this day commonly have a real fascination and fondness for food and as a rule are excellent chefs in the family kitchen. Extra regular exercise such as swimming, walking or cycling may be necessary to keep your waistline trim in later years. Your major strengths of character lie in the organized, cheery, down to earth charm you possess, these help you take each day in your stride. Alongside this positiveness your calmness and composure when others panic and cannot think or act quickly is another mentionable forte. Notable personality weaknesses for those born on April 22nd focus on your tendencies to be sometimes unsociable or inflexible. These negative responses could surface frequently as they are part of who you are, especially in your youth. However control of them is perfectly possible with a bit of thought and effort. Being born on the 22nd of April usually grants you a take life as it comes attitude and an inclination to not anticipate anything. The majority of goals you make are likely to be spur of the moment decisions rather than predetermined aims or plans. You will pursue a presented opportunity if you feel it will be a truly fulfilling achievement worthy of your time and patience. Your partiality for naturally beautiful things and the freedoms of the great outdoors is often a feature in your dreams. Visualizing yourself relaxing surrounded by natural landscapes is a characteristic dream. As you were born on the twenty second day of the month the pair of twos in your birth date generate a Root number of Four. This numerical reference to your birthday has the keyword 'Honesty' relating to your general open, kind and straightforward mannerisms. The Tarot card associated with your birthday is the 22nd symbolizing the Fool. This depiction reflects your resistance to change and unwillingness to compromise. The lucky gemstone designated for April the twenty second birthdays is Topaz. Wear it close for the possibility of increased happiness and wealth, greater self control and assertiveness. All Taurus personalities are believed to be principally astrologically influenced by the authority of the planet Venus. This main planetary influence is blended with Uranus's power as the cosmic ruler of the actual day you were born on, the twenty second of April. So both these celestial bodies are influential in individualizing the probabilities of your personality. Your high levels of determination and practicality are some of your finest attributes and come in useful throughout life. Your decisiveness and tender loyalty help in your pursual of emotional contentment. If you can attempt to be a tad more flexible it should assist the speed of your progress. Concluding thoughts pertinent for people born on April the 22nd are to continue to trust your instincts and try to never let pride hold you back. I know my mom is very responsible and hard working. She hasn't stop wanting to provide the family her efforts. But the only thing which tears me is that, she can be really mean and unconcerned, especially her words and accusations through the years hurts me the most. Tried my best to understand and give in but never will she show she appreciates. Although one thing to admit. She makes a devoting lover to my dad, while my dad always failed, she's always behind the screen supporting him and our unreasonable relatives who make use of him all the time, she supports his career and finances without anyone knowing, be it friends or relative. But why she treated her children so differently? I felt invisible to her. I'm never on her mind nor her priorities. But due to our long accumulated misunderstandings and fights for the last 20 years,and all the efforts I put in wanting both of us to talk and come to a peaceful and agreeable point so we can achieve peace. But instead, she make things worst by covering herself with all sorts of excuses, talking nonsense to us about "she die and we'll know", showing strange behavior like slamming doors, leveling up TV and music volume, basically, we're enduring all sorts of nuisance from her. Yet she still did not want to come forth and resolve all the quarrels and misunderstandings we had. I then realised I really don't know my mom as a person and I needed help. She can be so soft and not feel a thing being make use by some bad colleagues. Anyone who is a mom and born on this date, can you tell me what am I supposed to do? What's on her mind? Why is she behaving this way to us, looks like she hated me but why would any mom hate her own daughter, especially she is one who is down to earth and holds traditional values? I truly need some guide and hopefully I can reach out to her heart level to talk and to resolve the misunderstandings which is already from bad to worse now. It's so bad, I started running away from her, and wanted peace and shouted back at her, asking what she really wants? Enough is enough. This time round it caused me so much stress than I have my menstruation for whole month for the very 1st time. Very true to the extent its creepy xD very accurate. This is my birthday!! Happy late birthday to all of yall! wish you all a very happy birthday today the 22nd of april ,friends. I share the birthday with you. Wowww , This is all me!!!!!!!!!!!!!! Surprisingly negative lol. Did you have a bad relationship with a someone from this birth date or something? lmao. Oooohhh !!. . . . . That's d real me. . . . . . I'm surprisingly satisfied. That is my birthday, wow!!!! This fits me like a glove, almost! :-) I am totally NOT organized! LOL I am always amazed at how close these writings are, to the Taurus that I am. April 22nd is my day! Happy Birthday to all who share this day as their birthday!! this is amazing! as if I'm reading profile of my partner 100% accurate! !